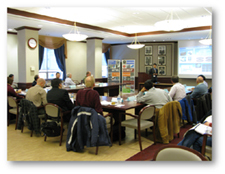 Since 2004, the Consortium has held semi-annual meetings to discuss the latest progress made in foaming techniques and tointeract with the partners in order to help solve their problems. These regular meetings facilitate constructive discussions, and are great networking and social experiences. Currently, more plastic is used in the world than steel, aluminum, and copper combined, so that plastics are increasingly regarded as the global pace-makers of progress. The extremely large number of present and future applications of plastics will increase the demand for plastic products over the coming years. This will result in a continuous industry growth at a very rapid pace. However, the economic, ecological, and social challenges facing the globe today and in the future will continue to seek new approaches to problem-solving in terms of combining high efficiency with low energy usage and great versatility of application. Thus, there is a great need for conducting accelerated research and development in the field of polymer science and engineering that will have to be focused towards the very highest level of achievement in product development, processing technology, and recyclability. In our view, due to their superior strength-to-weight and cost-to-performance ratios, cellular plastics and microcellular plastics should be considered as the utmost candidates for making this goal more attainable. Although we are aware that there are already a number of highly qualified individual researchers working in this area in the world, we propose to form an international consortium to further enhance the research and development of the key technologies for processing cellular and microcellular plastics such as extrusion, injection molding, rotational molding, compression molding, and so on. Real progresses in this area can have a major impact on the national and international foam-processing industry. Although this proposal is intended to address multiple objectives at a number of levels, it is the principal goal of this proposal to involve leading international foam processors, equipment manufacturers, resin suppliers, and foaming agent suppliers in conducting cutting-edge research. on developing innovative technologies for foam processing, equipment design, foaming agents, and materials modification. It is another goal of this consortium to facilitate the access of processors, equipment designers, resin suppliers, and foaming agent suppliers to highly qualified research personnel and establish a network for training of young engineers in the areas of technologies for processing cellular plastics. To achieve this goal, we have formed Consortium for Cellular and Micro-Cellular Plastics (CCMCP). We also plan to establish and elect membership of a Consortium’s Advisory Committee that will handle consortium-related management activities. The Research Programme of the CCMCP will encompass several research areas and project modules. In each of the emerging fields of interest, the Consortium will seek specific “How to improve” answers. However, the proposed project modules may be modified or new ones added according to sponsor requests. The Research Programme consists of five major research areas: (1) development of extrusionbased foam processing systems and technologies (polymeric foams, and polymer-based foamed composites,), (2) development of injection molding-based foam processing systems and technologies, (3) development of other foam processing systems and technologies, i.e., rotational molding and compression molding, (4) Fundamental studies to understand, model, and control cell nucleation and growth, (5) development of natural fibre plastic composites. Each research area is comprised of multiple project modules. Plastic foaming is a complicated process that involves a delicate thermodynamic phenomenon and a kinetic material transport. An understanding of the fundamental mechanisms and developing innovative processing technology cannot be simply yielded from either investigating real processing experiment or by applying purely theoretical approaches. The industry demands that a method be developed that can act as a bridge between practice and theory. Therefore, we propose that the experimental simulation and computer simulation be utilized as the bridge between processing technologies and fundamental studies (Figure 1). The overall approach to carry out the fundamental studies of the plastic foaming process is shown in Figure 2. The aim of this method is to establish models for cell nucleation and cell growth based on experimental simulation results. It is our intention that this approach can be eventually adopted by the plastic foaming industry to ensure overall success and provide them with the ability to choose the appropriate materials (resins, nucleating agents, etc. ), to select the proper blowing agents, to design the appropriate dies and processing systems, and to optimize processing conditions. The successfully setup of the approach will enable the Consortium members to shorten the time for making new foam products, decrease the cost of developing new foaming technology and enhance competence. Our project consists of four major steps: (i) experimental simulation to reveal the nature of the foaming process; (ii) development of mathematical models to account for the foaming behaviors based on the thermodynamics and computer simulation; (iii) execution of lab-scale foaming experiments on various processing systems; and (iv) identification of the critical issues for scaling up to industrial manufacturing. The results from the experimental simulation and computer simulation will be compared first. If the results are consistent, then the mathematical models for the foaming process will be achieved. Based on the models, strategies for the plastic foam manufacturing can be established and will be demonstrated using lab-scale foaming systems, such as an extrusion foaming system and an injection foam molding system. In the end, the technologies generated by our research efforts will be transferred to the industrial members of the Consortium. The membership of the Consortium is CDN$10,000 per year. Matching funds will be sought from the federal and provincial governmental funding agencies based on Canadian companies’ cash and in-kin contributions. The funds will be used for the salaries and operational costs of the projects. Three postdoctoral research fellows and 11 Ph.D. students, 3 M.A.Sc. students, and 15 M.Eng. students (part time) will be involved in the Consortium. An allowance is also foreseen for the ad-hoc involvement of expert academic staff and their direct costs. In the framework of four research areas fourteen research project modules have been proposed. The scope of the work per research module covered will depend on the number of sponsors it has been supported by. The intellectual property policy of the University of Toronto will be applied. Professor Chul B. Park is a recognized scientist with a proven award-winning track record in the world-class research community. He is the founder and Director of University of Toronto’s Microcellular Plastics Manufacturing Laboratory, and a member of the Advisory Editorial Board of the Journal of Cellular Plastics. Over the past decade, he authored or co-authored more than 190 professional publications in the field of polymer foam processing published in archival journals, the patent literature, a number of book chapters. In recognition of his outstanding research results and contributions, he has been decorated with the G.H. Duggan Medal from the Canadian Society for Mechanical Engineers in 2001 and received the Ontario Premier’s Research Excellence Award in 1999. Dr. Park’s research is unique, innovative, and relevant for both the academia and industry. He has made numerous breakthroughs in the polymer foaming field by focusing on the fundamental issues in the foaming science. As the prestigious endowed Canada Research Chair, Dr. Park focuses on broadening the knowledge of the fundamental thermophysical and rheological (deformation and flow) properties of polymer/ supercritical-fluid mixtures, and applying it in the design and development of novel processes for manufacturing cellular plastic materials with improved qualities.